Images and reports are spiraling out across the Web of a fire taking hold at the hotel adjacent OMA’s CCTV Tower. (Building calls it the TVCC tower.) Details, at least in English, remain slim, but a translation of Chinese reports suggest the fire broke out at 9:21 p.m. local time, or just after eight o’clock this morning in New York. A call to OMA’s New York office did confirm that the fire was in their building, which is still under construction, though all further inquiries were directed to the Rotterdam HQ. According to the translated reports, the site is swarmed with fire trucks and emergency responders who are struggling to keep the blaze at bay due to a shortage of water. The Times is reporting that Beijing had been full of fireworks throughout the night as part of lunar New Year celebrations, suggesting a probable cause for a fire that, the Times says, took all of 20 minutes to race from the ground floor to the top of the building. No official word anywhere yet as to the cause of the fire, if anyone was in the building, or if there have been any casualties. The BBC has some video of what can truly be described as an inferno (via Archinect). When we saw the fire, two things immediately came to minde: the tragic fire in August 2007 at 130 Liberty Street (could smoking construction workers be to blame? ), as well as the demise of another Dutch master’s work, Ben van Berkel’s Villa NM, which burned down last year in a mysterious fire. We’ll keep you updated as we learn more. Hopefully China correspondent Andrew Yang, who kept stumbling upon the CCTV tower and building paranoia over the last year, can shed some light. The Office for Metropolitan Architecture has learned that there has been a serious fire at the Television Cultural Centre (TVCC), the building adjacent to the headquarters of China Central Television (CCTV). The TVCC building was due to open in mid-May and contained a hotel, a theatre, and several studios. As we learn more about this tragedy, we will advise the public further. I think it’s very symbolic for Beijingers as an architectural pair. And then the other kind of layer that is the fact that it’s happened on the last day of the New Year. The fire’s still burning, and it’s just about midnight here, so ringing in the new year with this kind of disaster is very inauspicious, at least in the view of many Chinese. A lot of people in the crowd couldn’t help note that and this was just not a good omen for the new year. He also questioned the Beijing fire department’s ability to fight high-rise fires, though as we’ve noted above, that is even a difficult proposition here in New York. The Times is also reporting now that the fire is believed to have started around 8:30 p.m. local time, though possibly as early as 7:45 p.m. Bloomberg is reporting a representative for Mandarin Oriental–the operator of the 241-room, 522-foot tall hotel–saying that no one was injured. Erik Amir a senior architect at building designers OMA said the fire had destroyed years of hard work. “It really has been a rough 6-7 years for architects who worked on this project,” said Amir, who rushed to the site after hearing of the fire. “I think it’s really sad that this building is destroyed before it can be opened to the public,” he said. UPDATE 2: AN contributer Aric Chen reports. UPDATE 3: Little new news thus far, though people continue to push the fireworks allegations, including the Washington Post. Its report does include a good deal of news from the state news agency, chinanews.com, including that there are still no confirmed casualties, though seven firefighters have been hospitalized. The Post also reports that while fireworks are normally illegal in downtown Beijing, a reprieve was given for this year’s New Years celebrations, though no explanation is given as to why this year was any different than those in the past. Amongst many, many signs that the building boom has come to an end, from gridlocks of cars abandoned at the Dubai airport by fleeing workers to massive holes in the urban surface of Chicago, to entire architectural firms going out of business, to delayed towers and theme parks on pause, none seem quite as explicitly apocalyptic as the sight of OMA’s CCTV complex – that is, the part of it known as TVCC, containing a luxury hotel – roaring with flames. We still think it was the crane accidents last year that signalled the end, but this certainly comes in a close second. The architectural composition of the complex as a whole — which I toured with Scheeren over the summer, and which I argued in a year-end piece “already ranks as the most significant piece of architecture of our young century” — depends on the shorter hotel tower, which is known as TVCC. It is the hotel, in fact, that helps give the main tower its strange, shifting sense of scale. From certain angles the smaller section — no shrimp itself at 34 stories tall — looks like the tail of the big tower’s dragon, from others like a fleeing creature about to be devoured by the CCTV’s gaping mouth. Potent symbolism aside, though, I’d be very surprised if the hotel weren’t instantly rebuilt. The Chinese leadership has understood the graphic power of the CCTV complex — the way it suggests a modern, ambitious and innovative new China — from the earliest stages, and it seems highly unlikely it would allow the charred remains of the hotel to stand for any extended period. This is particularly true given Chinese sensitivity around the idea that its economy is rapidly losing steam. So there’s likely to be no drawn-out, painstaking investigation of the wreckage by some Chinese version of the FBI or ATF. As soon as the last ember is out, I’d guess, the bulldozers will be clearing the site to begin again. Even in a global slowdown — perhaps especially in one — construction in China can operate at lightning speed. The official news agency quoted a city government spokesman as saying initial reports indicated firecrackers set off to celebrate the Lunar New Year, China’s most important annual festival, has caused the fire. 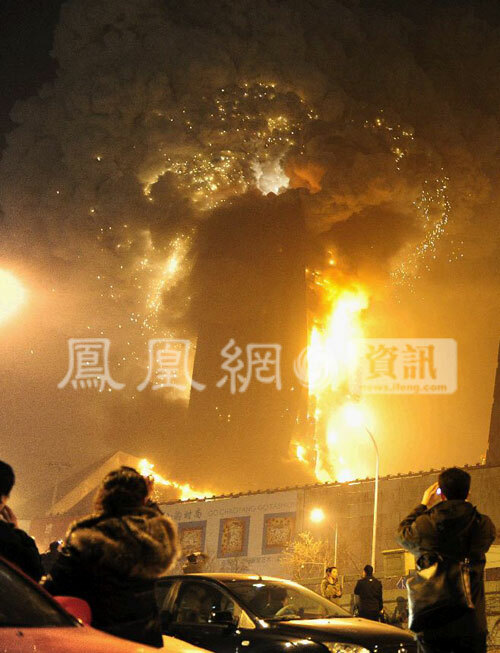 Firefighters found remnants of firecrackers on the roof of the burning building, Xinhua said. The agency had earlier quoted a witness saying the blaze appeared to have been sparked after fireworks landed on top of the hotel building. According to the AP, the fire was put out “early Tuesday morning. And with the sad and happy news that the fire has been extinguished, it is hopefully time to build again. I can’t help but think about a conversation I had earlier today with Alan. I asked if this was really as big of news as it seemed, or if we were simply particularly attuned to it because some big-name architect was involved. Would this still be making all the front pages were it just some regular old building, one in which almost no one was hurt? This is terrible for the people injured and Rem Koolhaas who is the consummate professional architect. Holy balls that looks insane. Notice how it did not collapse like WTC #7 which was the same size. Thats because it was brought down with demolitions. On BBC and CNN they said it had collapsed but it was still standing and not ‘pulled’ yet. More proof 9-11 was an inside job and that demolitions had been set up in the towers for weeks. Unbelievable the media establishment is afraid to tackle this…or is it? this must be a testament to the extremely high building standards they have in china, just like the high standards they maintain for food, drugs, manufacturing, environmental and agriculture.and to think that’s where some are planning to send the last american manufacturing jobs while the ‘brainier’ jobs go to india. Okay. So half the comments were about the fire itself, and the other half were 7 WTC related, or jokes about Chinese construction standards. Still, whether it is a product of the building boom or some other design phenomenon, there is no denying that architecture has indeed entered–and hopefully not exited–a golden age, where the work of Gehry and Nouvel and Herzog & de Meuron are celebrated worldwide. An age where good architecture by-and-large triumphs over the bland and banal. An age where people look up. Far from being a symbolic end, look to this as a new begining, a time for more reasonable, even-handed, well-meaning buildings. Not to say this and others weren’t. On the contrary. It’s just that, in these harder times, we can only hope the cream will continue to rise, from the ashes, with the phoenix, etc, etc. And that, somewhere, Rem Koolhaas is, if not smiling, at least smirking. Keep fighting the good fight. It was really gut-wrenching to see TVCC burn like that, itself like a firecracker. I woke up to read that one firefighter was killed in the blaze and several others injured. The Chinese media are so far not even reporting it. According to Shanghaiist.com, a notice was sent to all major organizations by the government to stop reporting the fire last night. As to the cause, a lot of people are speculating that it was caused by fireworks. There are three major firework nights during the Chinese New Year–one on the eve of Chinese New Year, one five days in, and the third was just last night, on the first full moon of the cycle. During the festival, people can buy July 4th-grade fireworks all over China, and fire them off, literally next to buildings, on roads, on sidewalks–they light them up just about anywhere. Of course the cause of the fire is still not known, and may not ever ascertained, since this matter is something that the Chinese government is going to be controlling very closely. UPDATE 6: Day Two round-up, including an apology from CCTV, whose fireworks celebration–rather ironically celebrating the new buildings–caused the fire; reports of a local media blackout on the issue; and some critical takes on the fire.